It was with a little tinge of sadness that we served our last Soup Kitchen in The Gathering's current home. although we're not officially in our new home until the 1st of July we'll be serving next week's Soup Kitchen from there. The sadness however is far outweighed by the sense of excitement, not just amongst The Gathering's members but our Soup Kitchen regulars are seemingly just as excited. As we were telling the guys about next week they all told us that they already knew about our move, which means the local grapevine is working well. 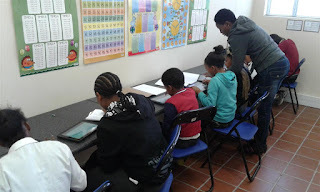 We also hosted our last Homework Club for this term and the kids were a little gutted to realise that it won't be running during the school holiday. We're definitely sensing an opportunity for some kind of holiday club in the Summer holidays. Precious has done a great job of facilitating The Gathering's Homework Club. We currently have 22 kids with four more asking to join today so from next term we will once again have a waiting list. Thank you Lord!